In 1974, Dennis Lynn Rader stalked and murdered a family of four in Wichita, Kansas. Since adolescence, he had read about serial killers and imagined becoming one. Soon after killing the family, he murdered a young woman and then another, until he had ten victims. He named himself "B.T.K." (bind, torture, kill) and wrote notes that terrorized the city. He remained on the loose for thirty years. No one who knew him guessed his dark secret. He nearly got away with his crimes, but in 2004, he began to play risky games with the police. He made a mistake. When he was arrested, Rader's family, friends, and coworkers were shocked to discover that B.T.K. had been among them, going to work, raising his children, and acting normal. This case stands out both for the brutal treatment of victims and for the ordinary public face that Rader, a church council president, had shown to the outside world. Through jailhouse visits, telephone calls, and written correspondence, Katherine Ramsland worked with Rader himself to analyze the layers of his psyche. Using his drawings, letters, interviews, and Rader's unique codes, she presents in meticulous detail the childhood roots and development of one man's motivation to stalk, torture, and kill. She reveals aspects of the dark motivations of this most famous of living serial killers that have never before been revealed. In this book Katherine Ramsland presents an intelligent, original, and rare glimpse into the making of a serial killer and the potential darkness that lives next door. "Confession of a Serial Killer stands out as the first [book] that takes the form of a collaboration with the serial killer. Unlike many crime books, it does not merely speculate about a predator's deranged thoughts and schemes but rather plunges the reader into them, revealing in remarkable detail how a well-known serial killer at the end of his life sees himself." --Rachel Shteir "The New York Times Magazine"
"Ramsland says her purpose [in writing the book] was to give criminologists, forensic psychologists and others some first-hand insights into a serial killer's mind, by relating the stories he tells, and how he tells them." --Rachel Shteir "Wichita Eagle"
For readers interested in the workings of the mind, psychology, true crime, and criminal justice, this is a unique work, in which the author is a conduit to the thinking process, rather than the descriptor of events." 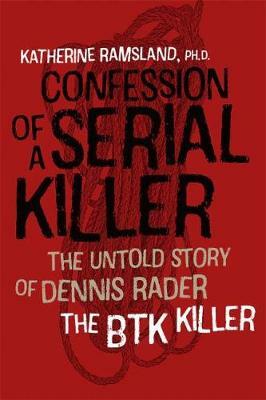 --Rachel Shteir "Library Journal"
"In Confession of a Serial Killer, Dr. Katherine Ramsland got Dennis Rader to reveal the dark fantasies that led him to murder." --Rachel Shteir "Rolling Stone"